This Big Oil Stock Continues to Decline at $80 per Barrel. Time to Buy? Even though Schlumberger's earnings continue to show signs of improvement, its stock just keeps sliding. With oil prices rising to around $80 a barrel, one company that should benefit immensely is oil services giant Schlumberger (NYSE:SLB). That hasn't been the case thus far, though, as the company's earnings have not kept pace with the rise in oil prices. In fact, its stock has gone in the opposite direction of international crude prices over the past three years. This past quarter, Schlumberger's results continued to head in the right direction, albeit more slowly than perhaps many would like. 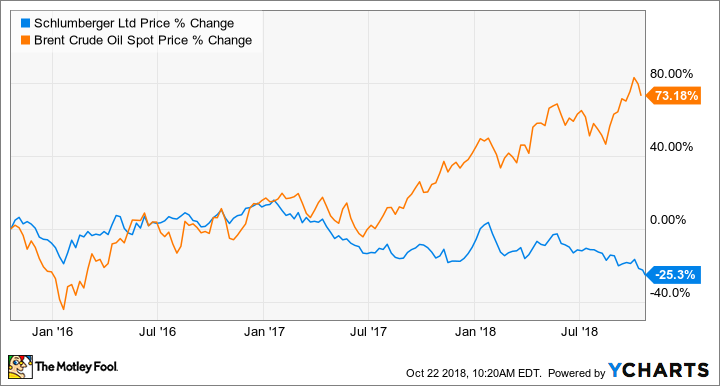 Let's take a look at the company's most recent results to see why things have been improving so agonizingly slowly and whether this continued sell-off makes Schlumberger an attractive investment today. DATA SOURCE: SCHLUMBERGER EARNINGS RELEASE. EPS = EARNINGS PER SHARE. Schlumberger's revenue and earnings continued to march slowly higher this past quarter thanks to improving activity across all of its geographies. What's even better news for the company is that international revenue grew faster than North America for the first time since 2014. Considering that Schlumberger's business is heavily weighted toward oil and gas activity outside North America, it's an encouraging sign. The one segment of the business that continues to struggle is its Cameron division. This is to be expected, though, because Cameron is an equipment manufacturing segment that caters to offshore developments. While we are starting to see oil and gas producers give the green light for new offshore projects, it will be some time before they are buying subsea equipment. Data source: Schlumberger. Chart by author. Another encouraging sign is that, aside from Cameron, margins for all of its segments also ticked up. As more and more equipment gets deployed to the field, it should put more pricing power back in the hands of Schlumberger and other oil services companies. For several quarters now, CEO Paal Kibsgaard has had a rather optimistic view of the oil market, at least from the perspective of oil services companies. According to his most recent statement on the oil market, he thinks we're still headed for much higher prices and much more capital spending. The oil market continued to tighten in the third quarter as seen by a further draw in global oil inventories and a significant increase in oil prices despite continued strong production from the U.S. and increasing output from key OPEC countries. Global spare capacity is now less than 2%. The tightening supply and demand balance is driven by accelerating decline rates in the international production base and is further exacerbated by the ongoing reduction in Venezuelan and Iranian exports. Geopolitical events and their impact on supply are also becoming an increasing oil market consideration as the challenging security situation in several key countries could affect activity and production going forward. And while the current Permian takeaway constraints in North America should be addressed within the next 12 to 18 months, a series of reservoir and production related challenges is emerging in the U.S. shale basins that could dampen the most optimistic production growth projections. You can read a full transcript of Schlumberger's conference call here. Patience is a trait you won't find in abundance on Wall Street, as evidenced by Schlumberger's continued stock slide. It was already trading at 52-week lows recently, and the postearnings slide means that Schlumberger now trades for less than it did when oil prices were $30 a barrel back in 2016 and are at their lowest levels since the Great Recession. Because so much of the company's business is tied to oil and gas activity outside North America, Schlumberger's earnings are going to take longer to recover. Not only does drilling activity change at a more measured pace than the Wild West world of shale drilling, but there are also still a lot of services companies bidding for contracts. That means there is still fierce pricing competition that impacts margins. Based on Kibsgaard's statements about the state of the oil market, though, we could see the international stage really start to pick back up. With that in mind, Schlumberger is the top dog in this industry, with a long history of generating superior rates of return for its investors. At today's stock price, it is one of the best investments in the pending boom in oil and gas spending.